In the vast majority of cases, we come away from MMA events talking about big moments that happened inside the ring or cage, like a crazy comeback, a wild back-and-forth battle or a creative finish of some kind. Occasionally, we end up talking about a fight that was announced or the night as a whole. Other times, we don’t have much to say about an event at all, which is never a good thing and once in a blue moon, we come away from an event talking about some kind of debacle that transpired. Now, these rare unforgettable moments of chaos, absurdity or overall confusion are few and far between, which is why they tend to stick out in our memory. While few people can tell you the co-main event of UFC 56 on command (Gabriel Gonzaga vs. Kevin Jordan), but they can tell you the story of where they were when Brock Lesnar snarled into the camera after beating Frank Mir at UFC 100 and cut a promo on Bud Light. 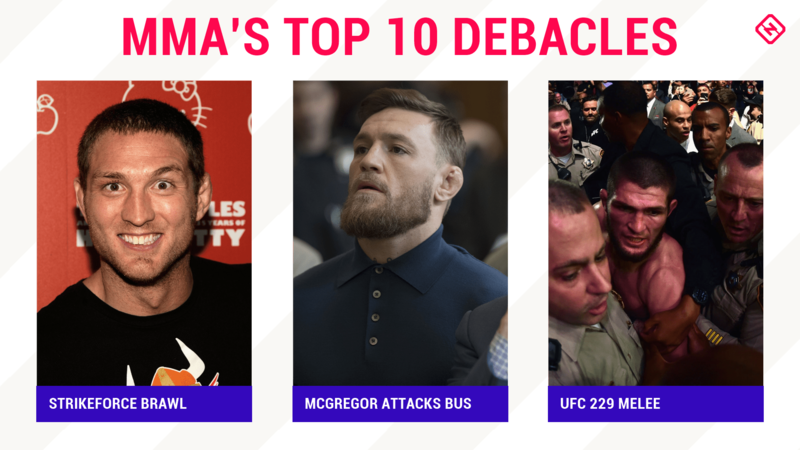 And now we’re here to celebrate those surreal moments when everything goes sideways in some way, shape or form with our picks for the top 10 debacles in MMA history. A little over a decade ago, Kimbo Slice was arguably the biggest attraction in all of MMA, signed to EliteXC and scheduled to fight on CBS in the main event of a card that featured Cris Cyborg on the prelims, “Ninja” Rua, Gina Carano, Andrei Arlovski fighting Roy Nelson, and Jake Shields defending his welterweight belt against Paul Daley. Kimbo was supposed to face Ken Shamrock, but the former UFC and WWE star suffered an injury hours before the event and was replaced by TUF alum Seth Petruzelli, who promptly knocked out Kimbo in 14 seconds, prompting Gus Johnson to start yelling, “Rocky!” over and over during the broadcast. There was a reason why Kimbo’s opponents and opportunities had been carefully selected up to that point and Petruzelli showed why, shattering the aura of the bearded backyard brawler. Not only did it end Kimbo’s unbeaten run as an attraction, but it became the final show in EliteXC history as well, making this an even bigger debacle once the dust settled and the smoke cleared. Most fans will remember this event as the night Georges St-Pierre unified the welterweight titles by exacting his revenge on Matt Serra. Some will recall it as the night Michael Bisping made his middleweight debut. But for some, this is the night of the worst fight in UFC history. Calling the bout between Quarry and Starnes a “fight” is actually insulting to fights because the entire 15-minute affair consisted of Quarry chasing down the Canadian middleweight, who refused to engage and doing more and more ridiculous things as the bout continued and Starnes remained averse to engaging. When one guy stops mid-fight and does “The Running Man,” you know you’re witnessing a debacle. Daley’s UFC run started with back-to-back first-round stoppage wins over Martin Kampmann and Dustin Hazelett, which set “Semtex” up for a title eliminator tilt against Koscheck. Now, Koscheck had a history of talking all kind of junk about getting into a shootout with guys only to turn to his wrestling and grind opponents out, which was a smart strategy, but had to be super-annoying if you were expecting a slugfest and instead spent 15 minutes wrestling a wet blanket. That’s what happened in this one and following three rounds of getting held on the ground and lightly roughed up, Daley got to his feet, walked over to Koscheck and punched him in the mouth. It remains the last punch the British knockout artist ever threw in the Octagon and the most memorable moment of his largely successful career. Poor sportsmanship is never a good look and always gets people talking after the fact. Shields and his teammate Gilbert Melendez pushed Miller away, but then fellow Skrap Pack member Nick Diaz threw a punch and chaos ensued. The entire thing transpired live on CBS and remains one of the most stupid and unnecessary post-fight incidents in MMA history. The only good thing that came from the situation was Gus Johnson declaring, “These things happen in MMA,” which has become the go-to line whenever something dumb happens inside or outside of the cage ever since. For a fight that lasted just 49 seconds, this one lit the fuse on a powder keg. Coleman, the former Openweight Grand Prix winner, and Rua, who had just capped off his Middleweight Grand Prix win six months earlier, were massive stars in Japan at the time and represented major teams, both of whom were present at ringside. In an early exchange, Coleman looked to slam Rua to the canvas and as the Brazilain reached out to break his fall, he broke his arm instead. It was gruesome, but Coleman didn’t know it happened and kept on fighting as the referee jumped in to stop the fight, which led to him landing a couple shots on the injured Rua. That prompted Chute Boxe members to storm the cage and go after Coleman, which in turn led to Hammer House members like Phil Baroni hopping into the ring to get involved as well. From a highly anticipated bout to a highly volatile altercation after the fact, this one still stands out. Jorge Rivera was a journeyman who put together a three-fight winning streak at just the right time to land himself a co-main event assignment against Top 10 fixture Michael Bisping at UFC 127 in Sydney, Australia. Prior to the bout, Rivera made a series of goofy, insulting videos taking aim at Bisping, a notorious trash-talker with a short temper and it led to the two going back-and-forth throughout the build-up to the fight. Once they hit the cage, the simmering tensions boiled over. Bisping blasted Rivera with the kind of illegal knee that is hard to describe as accidental or coming in the heat of the moment, as the veteran was on his knees in the middle of the cage. During the timeout, “The Count” got into a chirping match with the New Englander’s corner and then when the fight was over, Bisping circled back to spit at them. It’s great that Bisping can now look back and acknowledge that he was insufferable at many points throughout his career because moments like this live on in infamy and showcase how much of a wanker he could be when he really put his mind to it. The first UFC event to ever get canceled, this remains one of the biggest debacles ever. Nine days before the event was scheduled to take place, Dana White announced that Dan Henderson suffered a knee injury, forcing him out of his light heavyweight title fight against Jon Jones… and then the shovels came out. White laid the catastrophe at Jones’ feet, blaming the champion and his team at Jackson-Wink MMA for the cancelation after Jones declined to face Chael Sonnen on short notice. He called Jackson a “sport killer” and said declining to fight Sonnen would be the biggest mistake of Jones’ career. Man was he wrong, huh? Henderson mostly made it throughout unscathed, though it came out later that he was actually hurt three weeks out, which would have given the UFC more time to find a replacement had they been notified promptly. The fact that it was a relatively thin main card that had already been altered by injuries was never mentioned as a contributing factor by the UFC, though most in the community saw that as the greater issue. Bob Meyrowitz was one of the men responsible for the creation of the UFC and the MMA world is forever indebted to him as a result. Seven years after he sold the UFC, Meyrowitz launched a new promotion, YAMMA Pit Fighting, which held exactly one event before disappearing from existence and remains one of the most memorable debacles in MMA history. The fighters competed in an actual pit – a circular cage with slopped sides – and the first (and only) show featured a heavyweight tournament, some “Masters Division” fights featuring old UFC fighters and a super fight between “Butterbean” and Pat Smith. I wish I was joking. Travis Wiuff won the tournament, defeating Chris Tuchscherer in the finals in a reasonably okay fight, but everything else about this show and the organization, in general, was a complete mess. Even if you want to set aside the general hooliganism that took place and the fact that McGregor and Co. made the transatlantic flight to rally behind Artem Lobov, who had been cornered and accosted by Khabib Nurmagomedov and his team earlier in the week in Brooklyn, the fact that two athletes were injured and forced off the UFC 223 fight card during this madness is more than enough to make it one of the biggest debacles in MMA history. Not only were Michael Chiesa and Ray Borg forced from their bouts, but strawweight champ Rose Namajunas was severely traumatized by the situation and countless others could have been hurt. On top of that, you had the biggest star in the sport on video going haywire and then fleeing the scene before eventually doing a Perp Walk from a Brooklyn Police station and it all happened all to protect the honor of Artem Lobov. An event that should be remembered for setting a new record for the most pay-per-view buys in UFC history and the coronation of Khabib Nurmagomedov not only as the undisputed lightweight champion, but also a global superstar will instead always be remembered for what transpired after the standout grappler forced Conor McGregor to tap midway through the fourth round. Following the highly anticipated, largely one-sided contest, “The Eagle” took flight, scaling the Octagon wall and jumping off the walkway surrounding the cage into McGregor’s entourage on the arena floor. As a scuffle ensued outside the cage, more chaos kicked off inside the Octagon, as two different members of Nurmagomedov’s rushed in to take shots at the Irish superstar. With the split crowd at T-Mobile Arena on the brink of eruption, White opted to skip the usual belt ceremony in the cage and instead, the evening ended with Bruce Buffer announcing the results alone in the cage, minus all the usual pageantry. It was a weird, unnecessary end to an otherwise outstanding night of action inside the cage.